The dimensions of our access panels are always: width x height. The height is the locating face. We have over 5000 access panels in stock! Access panel with gypsum plasterboard inlay for installation in walls or ceilings. The favourable lower-priced to Heika-Star! For purchase values above 250 euros shipping is free of charge. For further information please check our general terms and conditions. 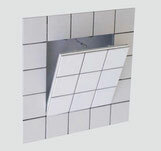 The access panels cover the access to the cavity behind it and can be opened for the purposes of maintenance. We offer access panels in different sizes and shapes. Our high quality panels are from Germany. They are produced conscientiously in accordance with the European standards. Because the quality is our top priority, each panel is thoroughly tested. The sizes mentioned here correspond to the dimensions of the opening. 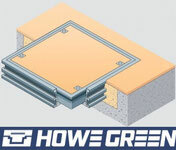 Unless otherwise specified, the access panels with gypsum are hydrophobic and therefore suitable for humid areas. The fire protection codes provide information about fire resistance. There is a distinction between Fxx and Ixx. The panels with Ixx codes are for solid walls or shaft walls, whereas the panels with Fxx codes are for ceilings or walls made of plasterboard. For example, F60 means fire prevention 60 minutes, I90- 90 minutes. Airtight and fire-safe access panels can be delivered with test certificates.